North Dakota police with military-style equipment surrounded Native Americans gathered in prayer against the construction of the Dakota Access pipeline on Wednesday, disrupting their plan to cross sacred and treaty-protected land in protest of a project they fear will destroy their livelihood. “ND authorities deploy armed personnel with shotguns and assault rifles, military vehicles, and aerial spray on peaceful Water Protectors gathered in prayer,” wrote the Sacred Stone Camp, in a Facebook post. Officers with military-style armored vehicles and shotguns threatened the protesters, who call themselves “water protectors” for defending the Missouri River from imminent pollution, reported Unicorn Riot. Up to 21 were arrested, the channel reported. In the video, Joseph said that “one guy’s about ready to blast us” but later added that no fires were shot. 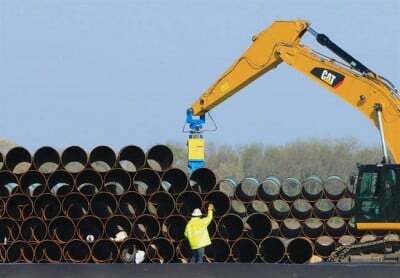 Police and private security personnel have been more aggressively cracking down on actions against the pipeline since the governor declared a state of emergency. The state is currently investigating an incident in which contracted private security film Frost Kennels unleashed dogs during a nonviolent direct action, ending with six bitten, including a pregnant woman and a child, according to organizers at the action. Alternative media outlet Unicorn Riot previously accused Facebook of censoring its livestream of police repression, saying they received a popup security alert when they tried to post the video. “We will not let them stop our mission to amplify the voices of people who might otherwise go unheard, and broadcast the stories that might otherwise go untold,“ they told RT. The pipeline, expected to transport over half a million barrels of oil a day through four states, has united over 300 tribes in resistance. Several lawsuits are pending against the company, which has retaliated with restraining orders. The White House halted construction on federal land, which makes up three percent of the pipeline’s path, but has not issued any other statement against the pipeline—motivating Facebook users to demand a response after Wednesday’s crackdown.